Around here, he is known as the Wizard. He is the talented Mr. Young and the Akers Signs Art Director, Jimmy. Jimmy and his new wife, Sarah hail from the Wadsworth, Ohio area. They are aspiring and motivated examples of go-getter millennials with drive and determination for a prosperous future. 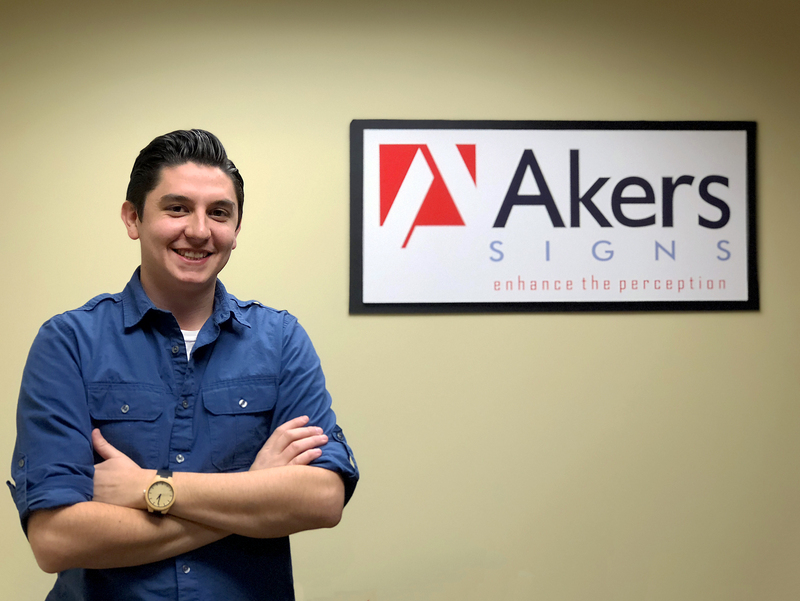 It is no wonder that Akers Signs is on the forefront of innovation and design in the sign industry with Jimmy as an integral member of the team. Jimmy has a polite and engaging demeanor. His intelligence, strong ethics and charming personality make for a pleasant experience and open communication when working through the design process. Jimmy takes the lead on assisting our patrons from concept to creation. He will work well with anyone needing signage that is artistically and tastefully tailored to meet their business goals. Not only has Jimmy consistently adapted to the sign industry and sharpened his artistic skill, but he makes every effort to continue to rise to new challenges and that makes him a highly valued member of the Akers Signs team. His personal style brings harmony to the office and his disarming, warm smile makes it difficult to have a bad day with him around. What you can expect when working with our Art Director is a pleasant, direct and positive approach. He will assist you in understanding all the options available for your designs and plans. You will have no lack of communication during this process as he will work to ensure you are satisfied with the results. Akers Signs is always on the lookout for the most talented individuals with strong work ethics, positive and engaging personalities and a commitment to excellence in all we do. Our quest to put together the brightest and best team to meet the customer’s needs never wavers. If you or someone you know, fits into that category and would endeavor to learn more about what the sign industry has to offer, we would be glad to hear from you and have a discussion with guidance on where you can begin your journey toward a fulfilling career in the sign industry. As always, Akers Signs is ready to discuss your sign project as well. Our areas of expertise include exterior electric signs such as LED displays, Monument signs, channel letters and more. Please inquire today to start a discussion about your success.